Yesterday’s Glam Hatters’ hen party activity was held in The Alexander House Hotel and Utopia Spa just outside London. I am not normally at my studio this early in the week but by chance Peter is looking after Tilly today and Lottie is at nursery, so I’m here, so excited to be in my studio, eating my porridge and blogging about yesterday’s fascinator making hen party. It was a bright sunny day and our train ride down to the venue had myself and the Glam Hatter Girls dreaming of living in the country with a big garden and either a laser cutting or sand blasting machine in the shed! 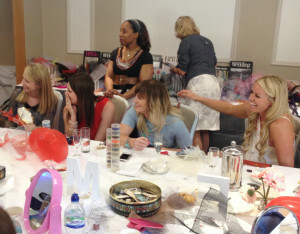 The party was booked for 18 hens and the organiser was Nathalie. She’s been organising the whole thing from her home in Hong Kong. You can tell a lot about how a hen party is going to be from the tone of the emails from the organiser and Nathalie was so warm and funny that I was really looking forward to meeting her and her friends. As the girls arrived arms full of presents, an iPad presentation, balloons and decorations for the tables, a polaroid camera etc, etc, I thought, who ever this hen is, she really is loved by her friends. 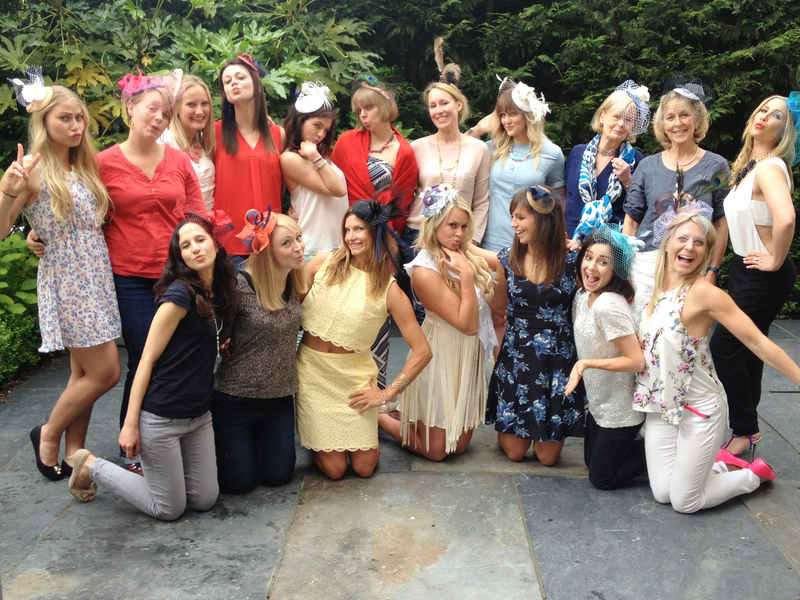 All the girls completely engaged with their task of making a fascinator, they tried out different colours, shapes and decorations and were totally unafraid to just go for it with complete enthusiasm. They were all incredibly well mannered, super fun and just a really, really lovely group of very successful people! I’m not a sporty person so I had no idea that Chemmy is a fabulously famous ski person. Through out the party we heard little snippets about skiing/dancing on ice/a very famous magazine covering the wedding and it began to dawn on us Glam Hatters that this was a special wedding. We left the party with cake and bubbles and Chemmy and her friends telling us how much they loved their fascinators and what a wonderful time they have had. On the train back to London we were all furiously googling @chemmyski as this is the address Chemmy had asked me to email the pictures to when her phone died a sudden death. So it turns out that our lovely hat making Chemmy just happens to be the Britain’s number 1 female alpine skier! 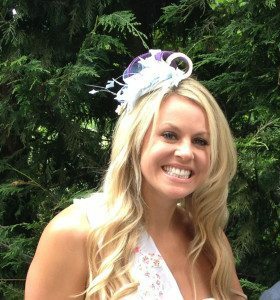 Chemmy Alcott is ranked 8th in the world and a 4 time Olympian… Well what do you know?! All the hens left with really fabulous fascinators, but I also took something away from the party. What I really “got” from meeting these girls is that Chemmy is surrounded by genuine people who really love her. She has a strong team of friends and a lovely partner who knows her really well. (Judging by the Mr & Mrs game they played – 100% pass rate!) In life as in a sporting career there are ups and downs. I have always admired sporting people for their ability to raise themselves back up after a fall, the tenacity to become such a successful sports person and the ability to do something that you love so well that you become one of the best in the world at that sport absolutely inspires me. But what I really loved about yesterday was seeing how a group of friends can hold and protect a friend to help her be the best she can be. In my own life I am also privileged to be able to work in a job that I really love. Since having my 2 daughters by life has become very busy. The work ethic that has worked in my world of babies, husband, friends and creative career is, “do one thing and do it really well.” I run hat making hen parties, that’s all I do and I do it really well. 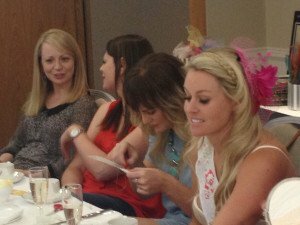 Book a party with us and you can be the judge, with hundreds of hen parties under The Glam Hatter belt I’m confident you will agree! 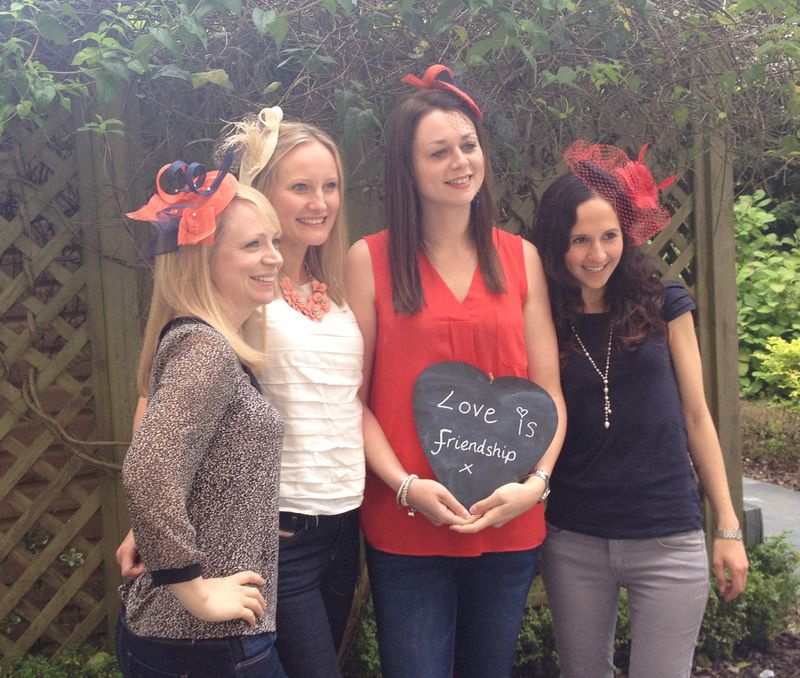 I am proud to tell you that the girls will be wearing their fascinators to Chemmy’s wedding. I’ll let you know when the magazine is out – I’m dying to see it!